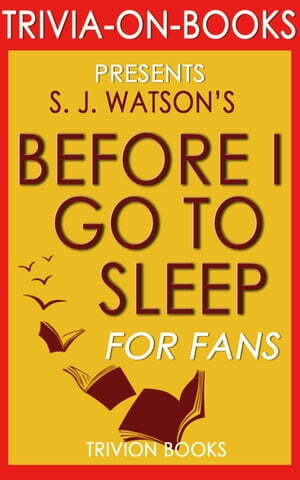 Collins Booksellers - Before I Go To Sleep: A Novel by S. J. Watson (Trivia-on-Books) by Trivion Books, 1230001208962. Buy this book online. Imagine that one day you are a vibrant young adult with the world in front of you but the next day, you wake up and no longer know who you are. You don’t know where you are or how you got there. To make matters worse, you hear a noise and realize that in all of this fear and confusion, you are not alone. What is happening? Why can’t you remember anything? Who is this man standing in front of you? You realize you need answers now! Trivia-on-Books is an independently curated trivia quiz on the book for readers, students, and fans alike. Whether you're looking for new materials to the book or would like to take the challenge yourself and share it with your friends and family for a time of fun, Trivia-on-Books provides a unique approach to Before I Go To Sleep by S. J. Watson that is both insightful and educational!